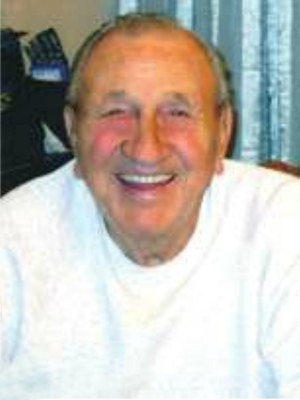 Obituary – Hughes, Jim « Perry High School Alumni Association, Inc.
Jim Hughes, 87, Perry, passed away at his home on Tuesday, March 29, 2016. Services have been entrusted to the care of Palmer Marler Carberry Funeral Home, Perry, Oklahoma. Services will be held at 10:00 am on April 1, 2016 at Christ Lutheran Church, Perry with interment to follow at Richburg Cemetery. Visitation will be held from 9:00am to 8:00pm, Thursday, March 31, 2016 at the funeral home chapel with family greeting friends from 6:00pm to 8:00pm. Jim was born on January 15, 1929 in Stillwater, Oklahoma to William Theodore and Flora May “Aunt Sis” (Howell) Hughes. 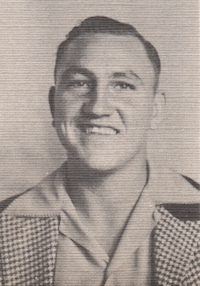 He grew up in Perry, OK and graduated from Perry High School in 1947. During his younger years he was very active outdoors and enjoyed hunting and fishing with family and friends. Following his graduation Jim started his long career at Ditch Witch and retired from there after 42 years. Jim married the love of his life Maxine in Perry on November 12, 1949 and they celebrated 66 years together. They raised three children; Randy, Bill and Deanna. Along with working at Ditch Witch, Jim loved farming and raising cattle. In the summer, Jim and his family could often be found at Keystone. He was an avid gardener who especially loved raising tomatoes. He would plant numerous plants, giving tomatoes to the neighboring farmers, family and friends. In his later years, Jim developed a love of cooking, especially desserts. Jim was a family man, who loved spending time with his grandchildren and great grandchild. He enjoyed going on adventures with his grandchildren. Jim was a caring man who will be missed by all his family and friends who knew him. Jim was preceded in death by his parents, his son Randy Hughes and great grandson Case Hughes. Jim is survived by his wife Maxine of the home; children – Bill and his wife Betty, Perry, Oklahoma; Deanna Vargas and husband Ruben, Vernon, Texas; brother Tom Hughes; grandchildren – Mike Price, Travis Hughes and wife Michelle, Nick Hughes and wife Kristin, Meagan Vargas, and Tanner Vargas; great-grandchildren – Kalil Price and Wyatt Hughes. Memorials may be sent to American Cancer Society or Christ Lutheran Church (i.e. quilting group, luncheon ladies for funerals or cemetery upkeep) c/o Palmer Marler Carberry Funeral Home, P.O. Box 189, 203 E. Fir, Perry, OK 73077.